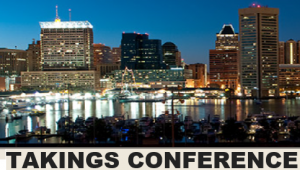 The University of Maryland Francis King Carey School of Law hosts the 18th Annual Conference on Litigating Takings Challenges to Land Use and Environmental Regulations on Sept. 25, 2015. This conference explores the takings issue as it relates to land use, environmental rules and other forms of economic regulation. In addition to offering a basic education in modern takings law, the conference brings together a diverse group of leading scholars and experienced practitioners to discuss cutting-edge issues. Some of the topics to be discussed include the practical implications of the U.S. Supreme Court’s recent takings decisions and pending takings issues before the Maryland Court of Appeals. The conference will also address the significance of the Supreme Court decision in Kelo v. City of New London on the 10th anniversary of that controversial case. Other issues to be discussed include potential takings issues arising from government efforts to deal with flooding and other disasters, local government access to insurance against takings claims, and novel takings claims based on the theory that property owners have an entitlement to regulatory protections.